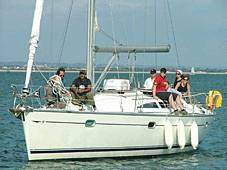 Bareboat yacht charters allows those with some sailing experience to plan their own itinerary and sail at their own pace while experiencing the wonders of a cruising area that they choose. Sailing qualifications are helpful, but they don't always tell the whole story. Many sailors have a wealth of experience without certification of any sort. So if you have no formal training it does not mean you can't skipper a bareboat yacht, but for the safety of all aboard, you must have experience of responsibility in sailing a yacht of a similar type, in the conditions you might expect, wherever you plan to charter. If you are in doubt, please discuss it with us. We offer a comprehensive hand-over service at Haslar Marina, Gosport and Falmouth Marina in Cornwall (other ports can be accommodated by arrangement). All boats are cleaned and set ready for the charter. You will be taken over the key features of the yacht, provided with an operations manual and the complete crew given a thorough review of safety procedures. The handovers for week and weekend sailing events are as below. However we accommodate flexible handover and return arrangements once we are made aware of your plans.